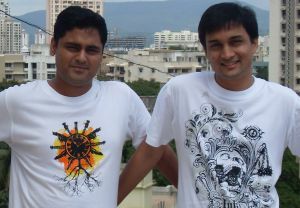 Three years ago, Kashyap Dalal and Navneet Rai; both batch mates from IIT-Mumbai, launched Inkfruit, a platform where anyone could submit, discover and buy custom t-shirt designs. The reason behind the launch was simple, they felt that the space of merchandise lacked home-grown brands and although India is filled with artistic talent, there was no proper platform for showcasing it. Now the website has relaunched itself as a social commerce site, with new products. In an exclusive interview with Techchircle.in, Inkfruit co-founder Kashyap Dalal traces the journey so far, how the two have scaled the company, the website's relaunch and his plans for the year ahead. The journey has been exciting. We launched in 2008 and the initial days were difficult because we were in a phase when online traction was just taking off. Having said that, I must say we have received a great response in terms of participation. There has been a steady growth even during the early days because of the awareness generated through word of mouth. What are the sales Inkfruit records on a daily basis? I cannot comment on the monetary value of the sales, However I can state that as of now 300 transactions take place on a daily basis. But we are well on our way to achieve our target of 1,000 transactions by the end of the year. What is the ratio of your online sales in comparison to your retail sales? The ratio is something we won't be able to share at this time but I can tell you that the online sales are growing very rapidly. I won't say which one is more than the other but the part of the business that is growing much faster are the online sales hence the online transactions are increasing rapidly. What is the process of submitting a design? There is a 24x7x365 days open door policy where a designer can come in at any point in time and share his design. If a designer gets a great response and people vote for his design, comment on it, share it on Facebook etc., it then gets selected to become a product on our website. We also have thematic contests - if we find that there is excitement around a certain trend or news, for example, corruption; then we launch a competition on the topic and then launch 5 to 10 products based on the winning designs. What is the remuneration for the designers? The prize money for an accepted design is anywhere around Rs.5,000 to Rs.25,000. This, in itself, is a significant incentive for them. Apart from that they receive exposure on our site or through retail outlets like Planet M, Life Style, and Central. There is a network of 300 shops across the country that carries the stocks of the products and every product carries the name of the artist in the form of a label. We believe that makes them feel really special. Are the designers paid royalty on their designs? Right now it is just a one-time payment for the designs submitted by a designer, although in the future may be we can get into that. Is there a binding commitment with a designer when his or her design is selected, or they can design for other companies in the future? If a design submitted to Inkfruit is accepted by us and we decide to start printing it then the artist does get into a legal agreement and that particular design becomes the exclusive property of Inkfruit and he cannot submit the same design elsewhere. The agreement is limited to that design only. What kind of advertising does Inkfruit do? Right now we only invest in online advertising - a mix of PPC (pay per click) and social media such as Twitter and Facebook. For example, we recently launched a t-shirt supporting the anti-corruption movement and within ten days received more than 1,200 likes and 900 comments on Facebook. We do not rely on discounts for sales; instead believe in making the products exciting enough to be bought irrespective of discounts. And if discounts are offered, they act as a sweetener rather than the purchase happening because of the discount. There are two main differentiators - one is the content, two words that really personify Inkfruit are fun and creative; that is the driving force. The other is our co-creation model, which keeps things exciting. This model ensures that every new launch by Inkfruit is different, because every artist thinks differently and there is a lot of creativity. That's what helps us capture the central thought of fun and creative. Who visits Inkfruit, can you tell us about your target audience? We tend not to define a target audience in terms of age; we look for people who like creative stuff. In terms of actual purchase, it would boil down to the people between the age group of 18 to 35, living in the top 20 cities. This is where people purchase Inkfruit products the most but it doesn't restrict Inkfruit to that. Inkfruit raised $3 million from SAIF Partners in January, what have you invested it in so far? Investments from the funds raised have been largely in infrastructure building, team building and marketing activities. That is a vertical within the design team- there is a constant experimentation than happens and products developed in-house are launched under the banner of Inkfruit labs. These products are more focused on innovation, for example, around Holi we created a T-shirt which had 'Holi' written on it and as soon as water was splashed on it, it starts bleeding different colours. Similarly, we launched an ultraviolet (UV) range where it shows a drum set and once you step out into the sunlight, a drummer appears. Inkfruit has re-launched its website, what's new in it? It is in a true sense a web 2.0 website, which is all about participation and engagement. It's about people running the show rather than somebody just providing them with content. The idea is that every product that is available for sale is not something created by some invisible designer in the background; it is something designed by one of the participants - one of the users on the site, and is uploaded by that person. A particular design is selected by a thousand users who vote and tell us they want it printed. It's only then that a product is printed and declared. It is not designed like a conventional e-commerce website which is completely focused on the transaction process; it has certain elements that are very strongly engaging the e-commerce aspect with the community aspect, so it is a bridge between the two. Can people buy Inkfruit products from other online shopping sites? There are a couple of sites where the Inkfruit products are available - Myntra.com stocks Inkfruit products, they buy the products outright from us and then sell it their network. Why haven't you opted for outlets like Big Bazaar and Hyper City for your products, it's where mass footfalls takes place? I believe outlets like Lifestyle and Central do have large footfalls, but actually we are very selective about the choice of outlets as we want to make sure that the right kind of audience is getting in touch with the brand and consuming it. We are not looking at selling at stores like Big Bazaar presently, however if the point of purchase is relevant, and we see the right kind of audience, we will expand. Any plans of an exclusive Inkfruit retail store? There are no short terms plans as of now, however it is a possibility in the future. There are a lot of players that are doing interesting things, where as some of the old players are focused on only specific things and that is where I feel Inkfruit is completely different, we don't have a central guiding rule that we are just going to do Indian humour or caricatures on T-shirts. It is difficult to say who our biggest competitors are because the products that come out of Inkfruit, to some extent compete with all the brands, for example the apparels that we launch compete with the Lee's, Levi's and the Pepe's of the world, then in the footwear segment we see Puma as our competitor. So at the end of the day we are competing with everyone in the respective product categories. We will add more products as we build Inkfruit into a complete portfolio where people can find amazing creative content in various product ranges. That will be our primary focus till the end of the year. Apart from that, we will focus on generating more awareness about Inkfruit.